Sometimes also spelled as Beas Kund trek, the Beas Kund Trek starts from Manali through the famous Solang Valley which is 15 kms away from the Manali town. While crossing across the Solang Vally which is famous for its sky slopes, one can find the lush green meadows, glaciers and snow capped mountain peaks all around the valley. 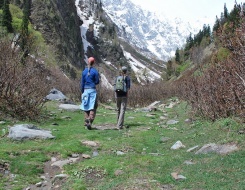 The trail further carries the trekkers via Dhundi and Bakarthach to enter the Beas Kund Glacier where the origin of the River Beas can be found. “Beas” is a derivative form of the name of the legendary author Maharishi Vyas who scripted the noted epic Mahabharata. 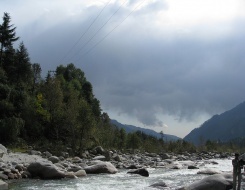 The name has been christened to the famous river originating from the Beas Kund and proves to be the remarkable destination for the trekkers and the tourists. The Beas Kund acts as the base camp for climbing Ladakhi and Friendship peak. Through the fascinating routes, the trekkers and the travelers can get an opportunity of exploring different impressive places at Delhi, Chandigarh, Manali, Solang Valley, Solang Nala, Dhundi, Bakkaer Thach, Beas Kund and the most magnetized the Dhauladhar Mountain Ranges.